Have you ever had a book make you cry like a baby? Charlotte’s Web was the first book that I remember causing a visceral, deeply emotional response. I was in first grade, and when Charlotte died, my little heart broke into a million pieces. Since then, I have laughed and cried, been transported to a thousand places and back, but there will never be another first connection to literature. That connection inspired a life long addiction to the written word – for that matter, the written word, the spoken word and the quietly pondered yet unspoken or unwritten word (yep, I’m a talker). For that reason, Charlotte’s web will always have a special place in my heart and I wanted to share that wonderful story with my own children. This theme night was so fun to create. 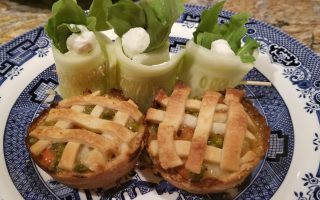 The menu included Wilbur’s prize winning pork chops – stuffed with a ricotta and spinach filling, Fern’s farm fresh salad, Templeton’s cheesy mac, and of course, Charlotte’s web waffles for dessert. 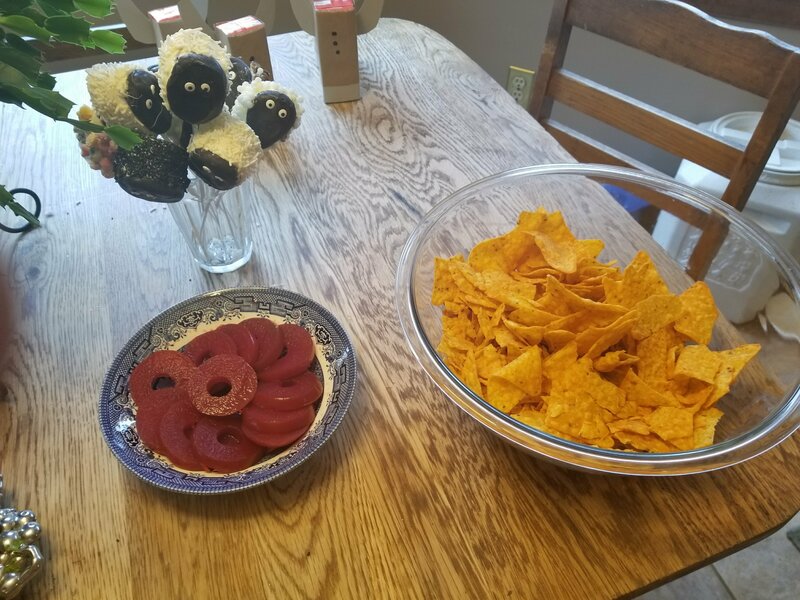 My 9 year old thinks I have a bit of a sick sense of humor for serving up Wilbur’s cousins while watching Charlotte’s web – well ladies and gentlemen, she’s right. I admit, it made me giggle a little. I’m so mature. I started with four beautiful butterflied pork chops. I made a rub of 2t salt, 2T paprika, 2t garlic powder, 1t black pepper, and herbs de provence. 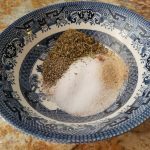 The herbs de provence you get here in the states can be different than the traditional herbs that you get in France because of the lack of lavender – be sure to read the ingredients to get the right mix. I used a bottle that I picked up the last time I was in Paris – I love that floral hint, but use what you can get. 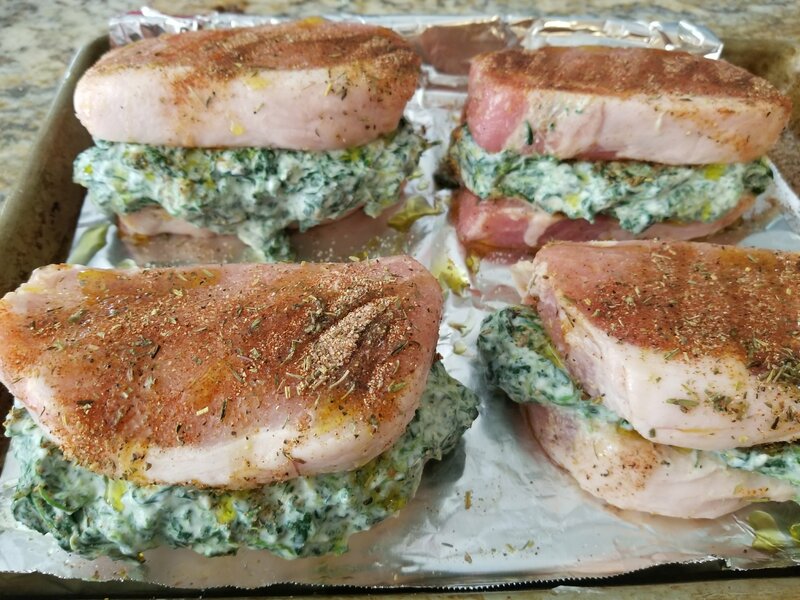 Once I mixed the rub and applied it to all sides of the pork, I drizzled with a little garlic infused olive oil, wrapped in plastic and put them in the fridge to hang out until dinner. 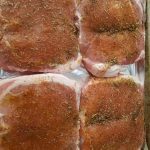 Ideally, you want 2 to 4 hours for the rub to flavor the pork. While the pork is marinating, I made the filling. I am using a pint of ricotta, one box of frozen chopped spinach, 2T. garlic powder, and salt and pepper to taste. Easy breezy! The best part of the filling is the quantity. 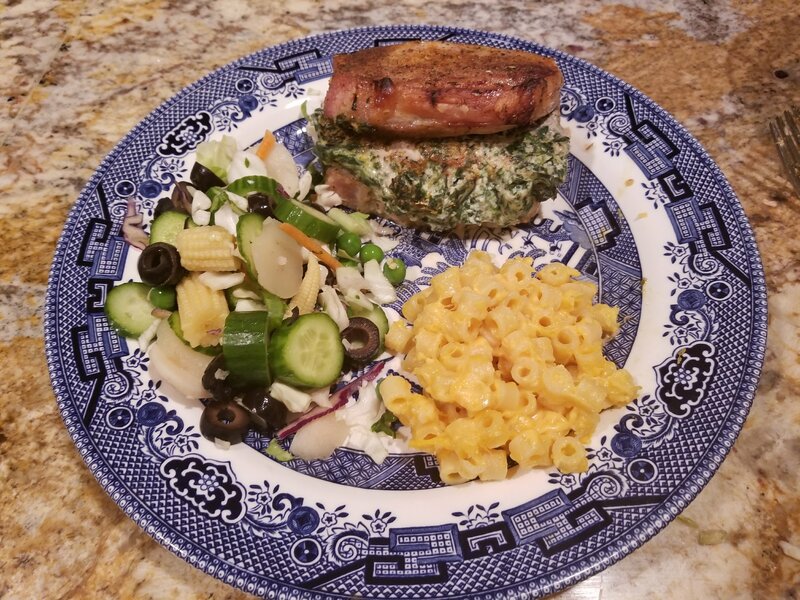 Once you finish stuffing the pork chops, you will have enough filling to make stuffed shells later in the week. 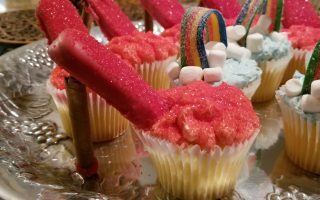 I can taste them now! The salad was easy. Start with the lettuce base of your choice. My daughter loves a layered salad. When I make mine, I usually make a tossed version of the layered salad minus the dressing. She loves a particular kind of Italian dressing, so it is easier to mix all of the non dairy toppings in a bowl to store in the fridge. When we are ready to assemble the salad, we start with the greens, place a good amount of vegies on top, and sprinkle some cheese. 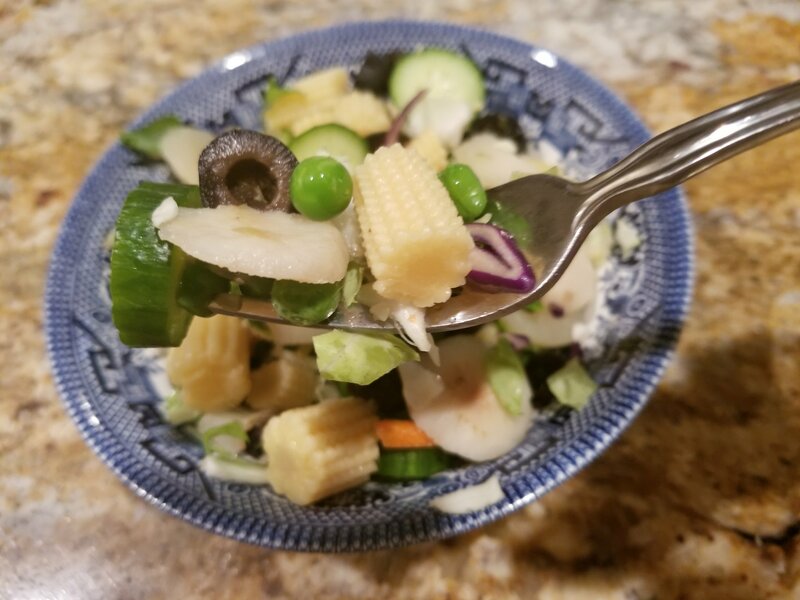 For the vegi blend, I use one half bag of frozen peas, one can of baby corn, one can of sliced water chestnuts, one large can of sliced black olives, and we are done! You can add mushrooms, red onions, or any vegi of your choice. Templeton’s cheesy mac was the easiest dish of the night. I started with ditilini pasta. We change it up from the standard elbow in our house. Once the pasta is done to your preference (don’t forget to season the water with some oil and salt – it does make a difference! ), I use one packet of Velveeta cheese sauce and two cups of Colby jack shredded cheese. Once the cheese has started to melt and string a bit, add a splash of heavy cream and stir. I admit, I cheated on the waffles. There are a great little Spider Man web waffle out right now that perfectly fit our theme. I took a bit of Hershey’s chocolate sauce, popped it into a ziplock bag – snipped the tip, and piped around the edges to provide some flavor and an aesthetic relief for the webs. 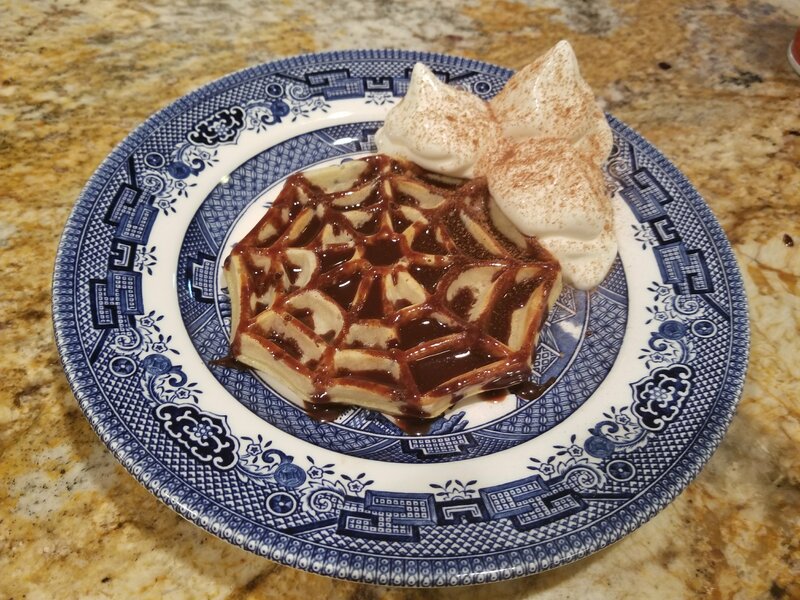 If you feel particularly creative, you can use melted chocolate or icing and pipe words into the center of the waffles. Just in case you are wondering, if I don’t leave the room, yes – I still tear up. Happy theming everyone!